Karen Ripley has been performing for over 35 years as a comic and improviser. She came on to the gay comedy scene in 1977 in San Francisco. From the cover of the East Bay Express (Berkeley, Ca) with Whoopi Goldberg to Ms. Magazines top 100 Lesbian Comic 2009. 2005 SF Fringe Best Musical Comedy with Annie Larson in the original play “Show Me where it Hurts,” and 2006 Diva Fest. with “waiting for FEMA.” Ripley has traveled all over the USA and the Caribbean. Featured in Logo's Wisecracks episode 2. And from coast to coast making the LGBT community laugh. 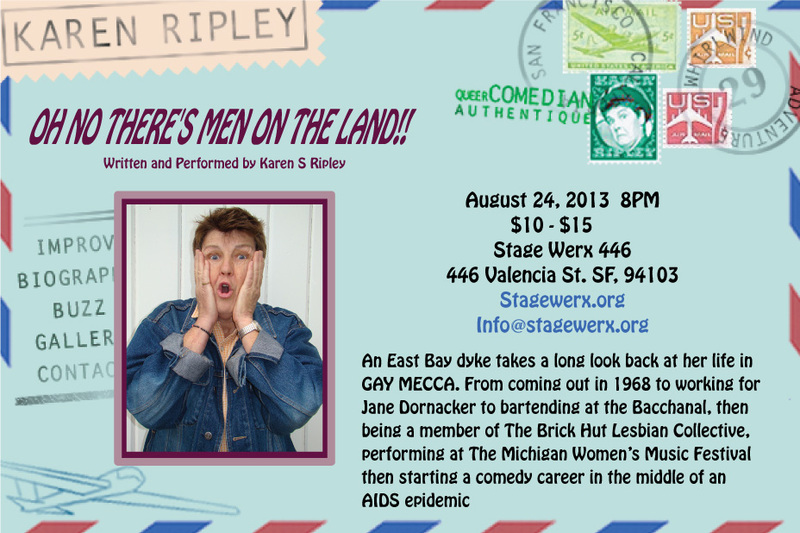 BERKELEY, CA (9 June 2015) – The Marsh Berkeley announces the return of Karen Ripley’s new show OH NO, THERE’S MEN ON THE LAND with performances August 15 – October 3. Called “One of the funniest comics out there today” by KQED, Ripley will take audiences on... Read More! NEW SHOW! OH NO THERE'S MEN ON THE LAND!! Fridays 8pm Saturdays 5pm no intermission, age 14 and older. SHE TORE UP THE CROWD WITH ONE-LINERS"
"Girl you are wicked funny." "Comics come and go but Ripley is a keeper! The good ones last a lifetime." "One of the funniest comics out today." "Karen Ripley was the story of the night. With a deadpan delivery rivaled only by Steve Wright and possibly Eeyore." "I have never laughed so much during an hour in my life!" Copyright© Karen Ripley. All rights reserved.